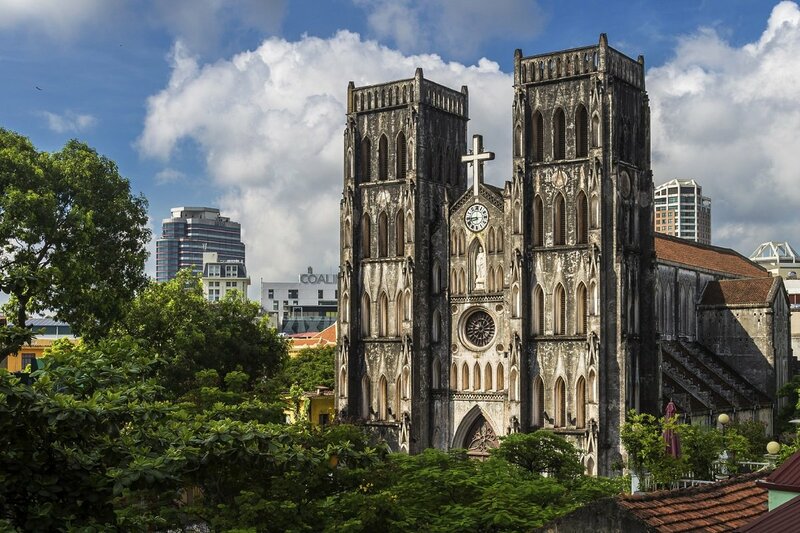 This 17-day tour takes in the classic sights and attractions of Vietnam, as well as the UNESCO Cultural Heritage Site of Angkor Wat, presented by skilled, local, English-speaking guides. 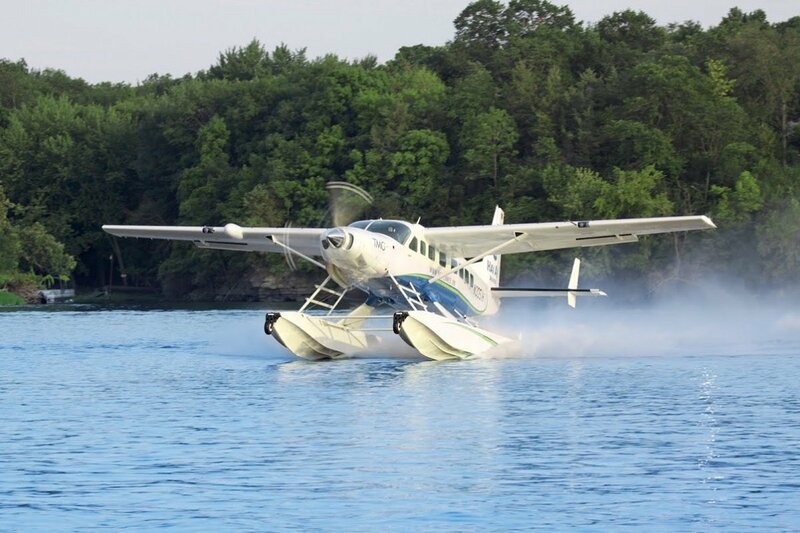 The itinerary includes plenty of breaks during which you can explore the various destinations for yourself. 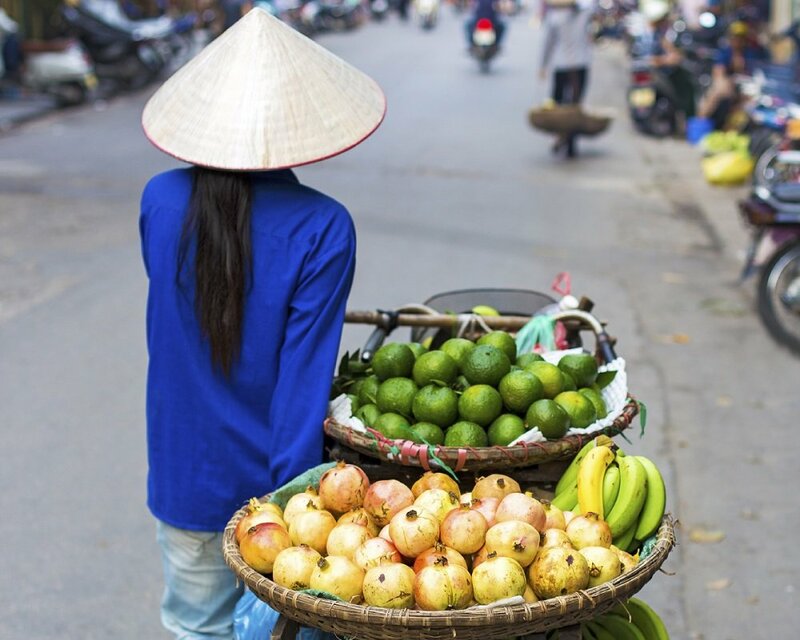 The tour starts in the beautiful city of Hanoi in the tranquil north of the country, showcasing the contrasts between the modern and more traditional parts of the city. 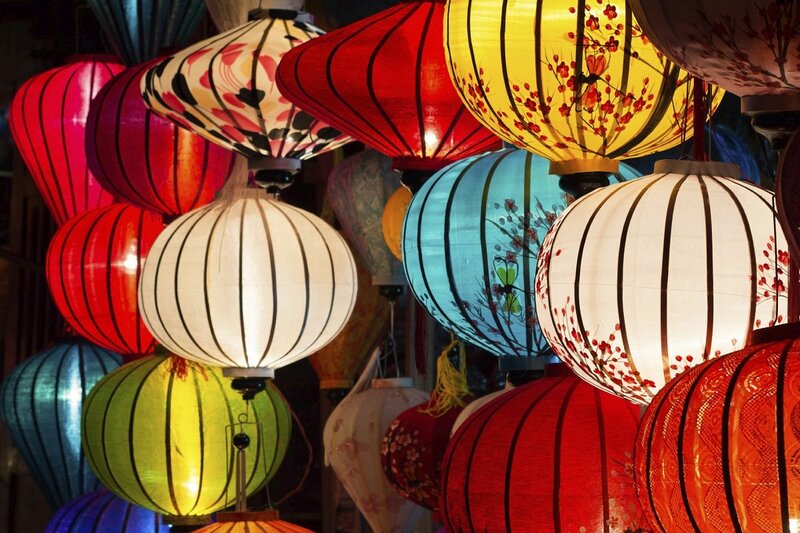 You have every opportunity to experience UNESCO Heritage Sites (both natural and cultural) at first hand during visits to Ha Long Bay and the old streets of Hoi An. 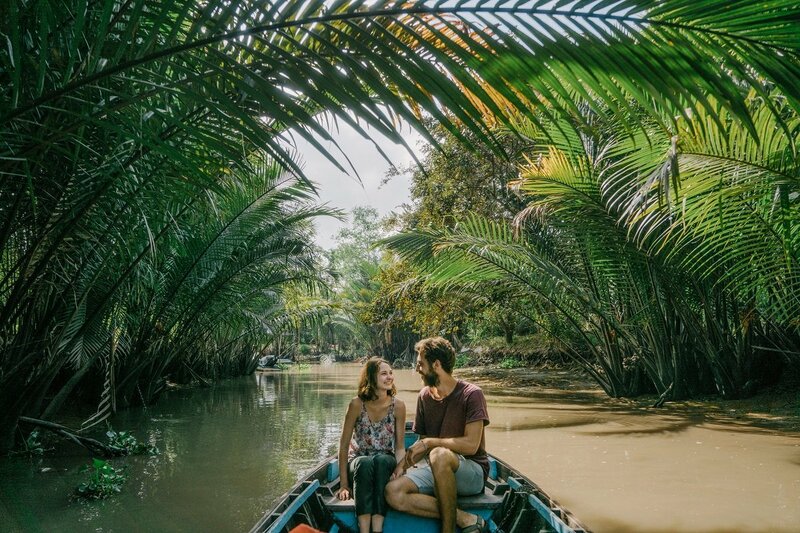 In addition, you can immerse yourself in more modern history in the Cu Chi tunnel network – an indelible symbol of the guerrilla war waged by the Viet Cong against the American forces. 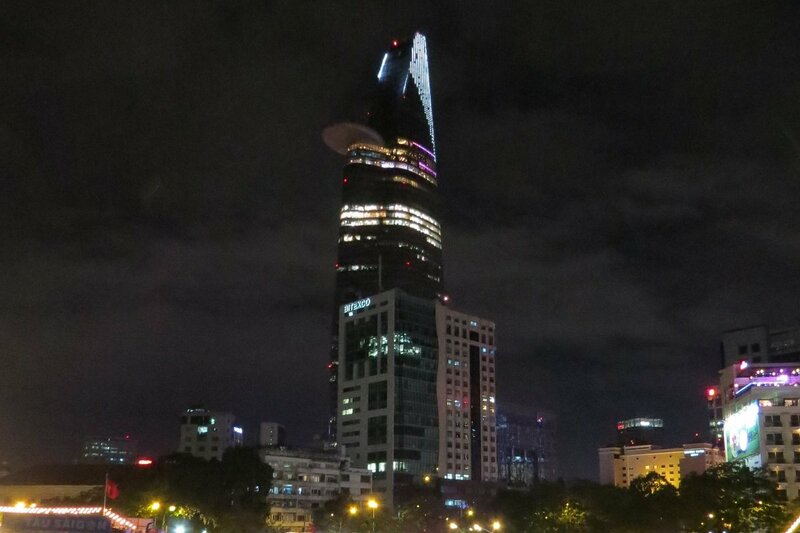 Ho Chi Minh City is the economic dynamo of Vietnam, and the contrast to Hanoi is clear to see. 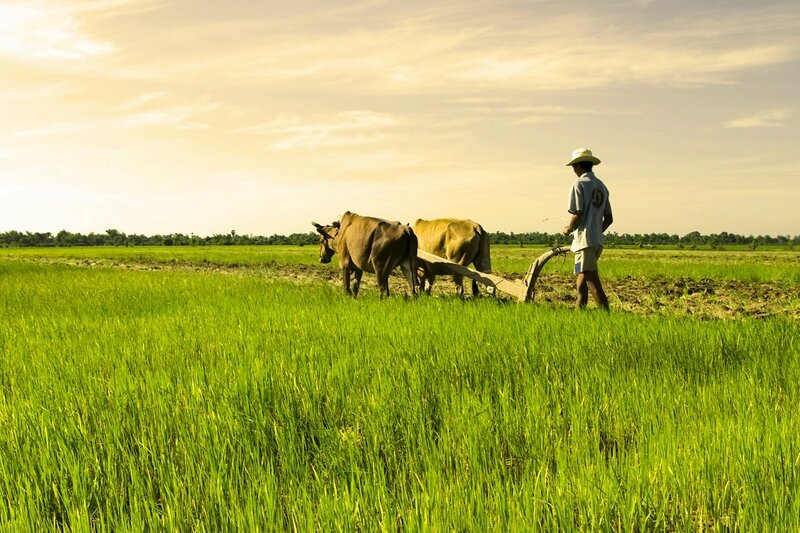 In the Mekong Delta, you can admire the fertile ‘pantry’ of Vietnam, with its floating markets set against a background of green paddy fields and fruit plantations. 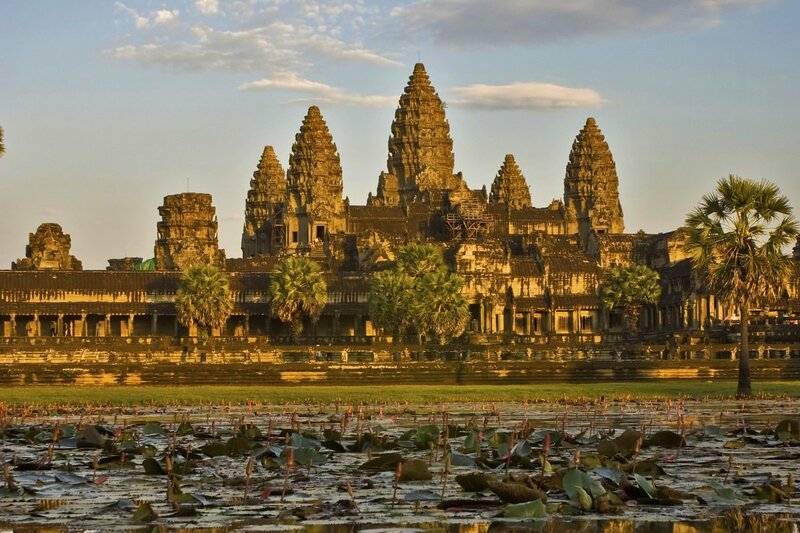 Your trip winds up in Cambodia with a visit to the Angkor Wat temple complex, which features on the UNESCO World Heritage List. 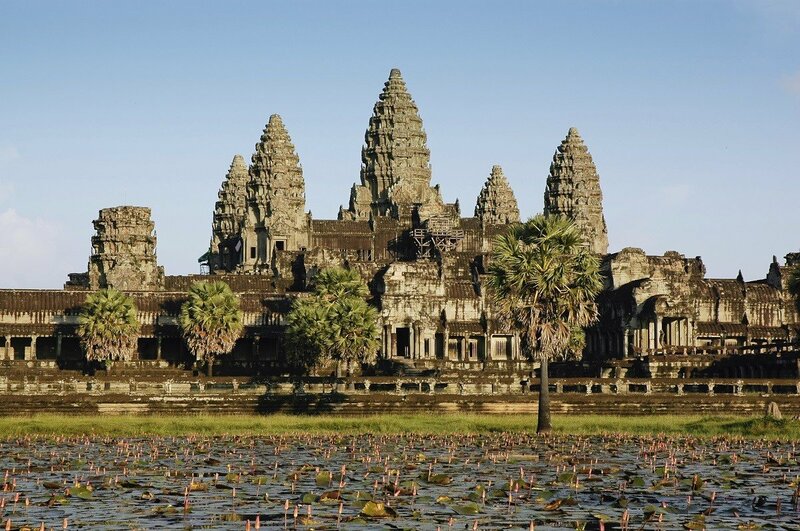 Your visit will take you to both Angkor Wat and Angkor Thom. 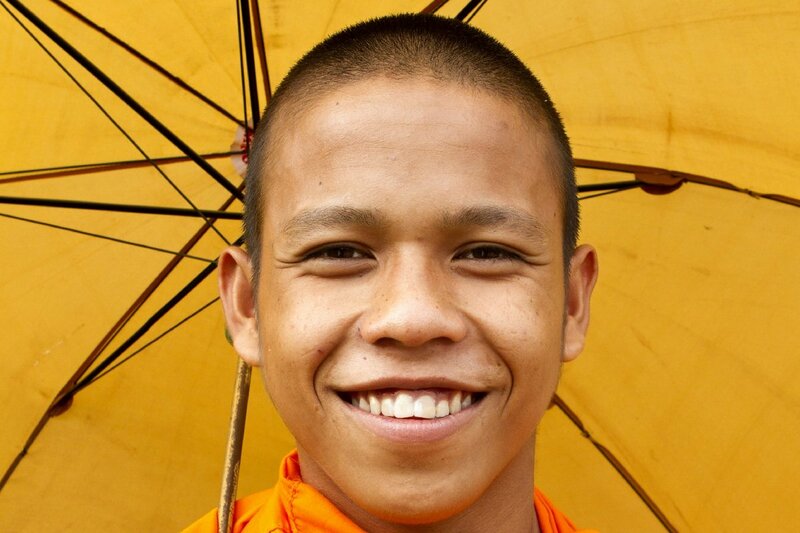 You will also have a day in Siem Reap, where you can explore the local area for yourself. After arriving in Hanoi, you will pass through immigration before collecting your luggage. You will be met in the arrivals hall by a guide holding an Asiatours sign, who will accompany you to the hotel where you will be spending the next two nights. Having checked in at your hotel, the rest of the day is yours to do with as you wish. 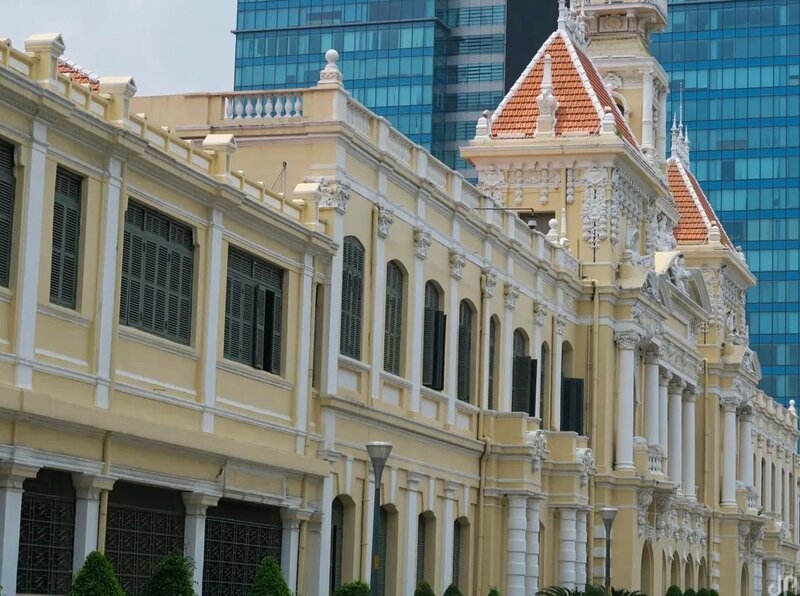 For example, you can saunter along the busy streets and alleyways of the exotic old quarter, stopping as you please to admire the sights and sounds of this amazing city. Hoan Kiem Lake is close by; it takes about half an hour to walk all the way around it – a delightful stroll in the shade of the tall trees. 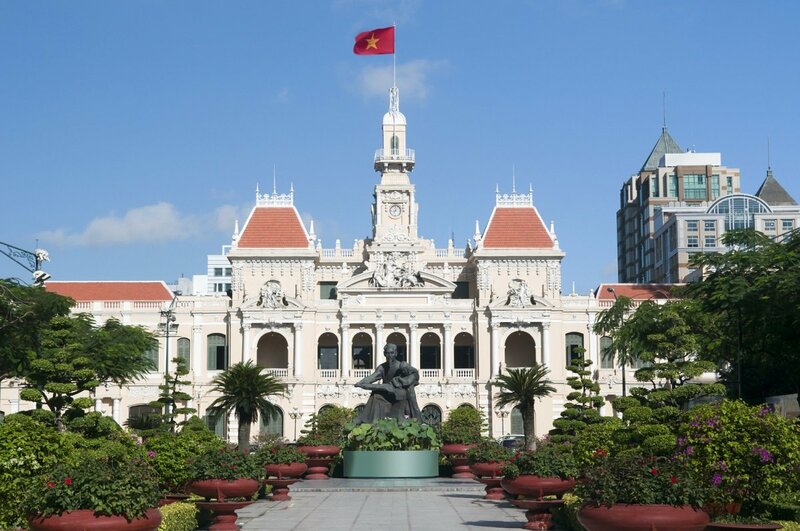 Today, you can look forward to a fascinating half-day sightseeing tour that takes in the biggest sights and attractions in Hanoi. Your itinerary starts at the Temple of Literature, which was built in the 1100s by students of the Chinese philosopher Confucius. 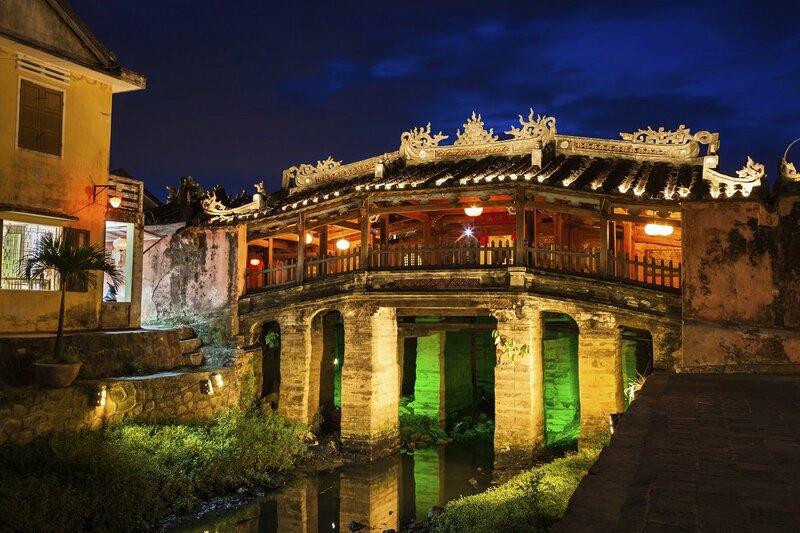 With a history stretching back almost 1,000 years, the temple is one of the last remaining examples of traditional Vietnamese architecture. 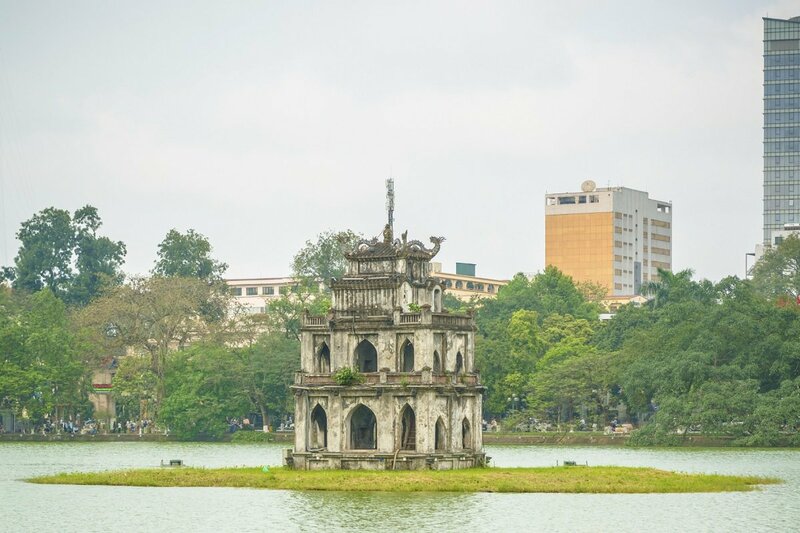 It is then time to visit the Ngoc Son Temple, which is located on a small island in the beautiful Hoan Kiem Lake. Access to the temple is across Huc Bridge, whose name literally means ‘the placed touched by the rays of the morning sun’. Here, you will hear the legend of the Emperor, the magical sword and the giant turtle after which the lake is named. 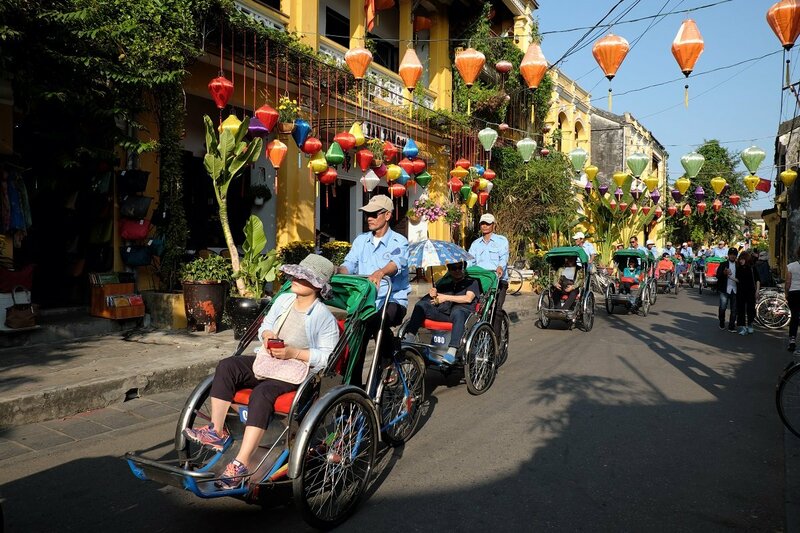 The next treat is a ride on a traditional ‘cyclo’ – a bicycle taxi – along some of the 36 streets that make up the charming old quarter. The local citizens flock to the area to buy everything from noodles to Buddha figurines. The 36 streets in this part of the city were named after the goods traded there, and ‘Bamboo Street’ and ‘Tin Street’ still live up to their names. 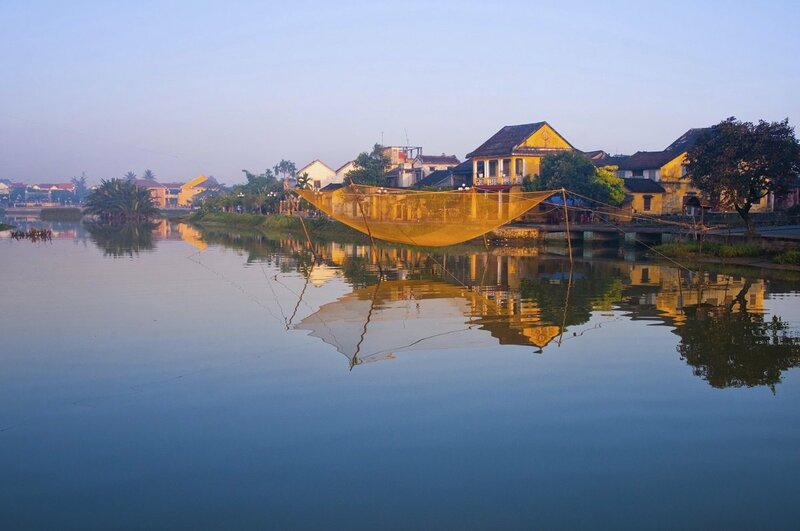 Your sightseeing tour concludes with a traditional performance at the water puppet theatre. 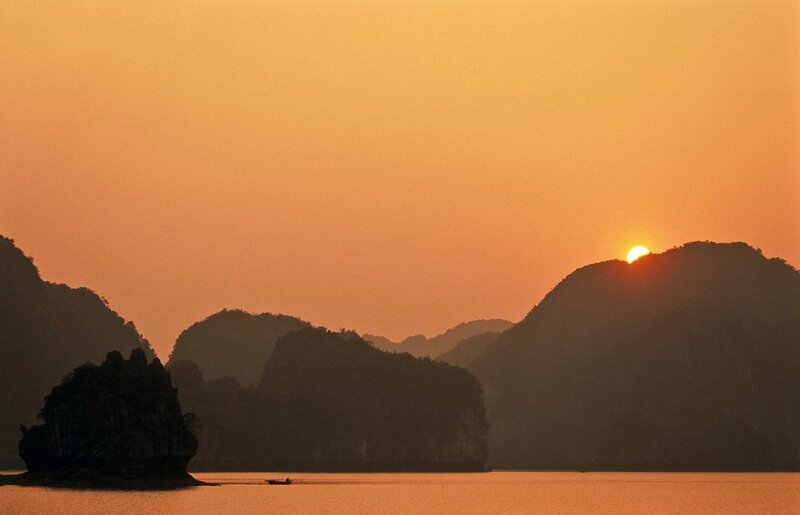 From Hanoi, your tour continues through the fertile delta of the Red River to Ha Long Bay. 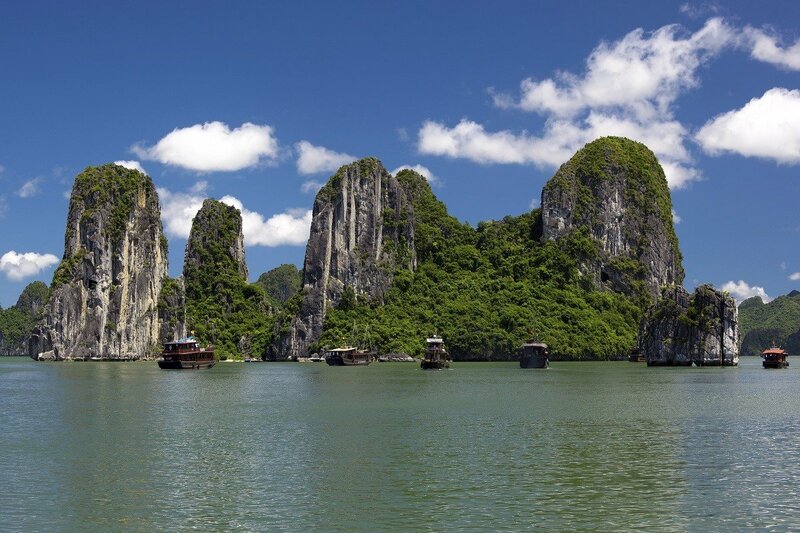 For this mini-cruise around Ha Long Bay, you will be sailing on the cruise ship Emeraude. The vessel heads out among the scattered islands in the bay, giving you the opportunity to enjoy the sights, sounds and scents of the sea and the magnificent cliffs and islands. You can also experience life in a traditional fishing hamlet. 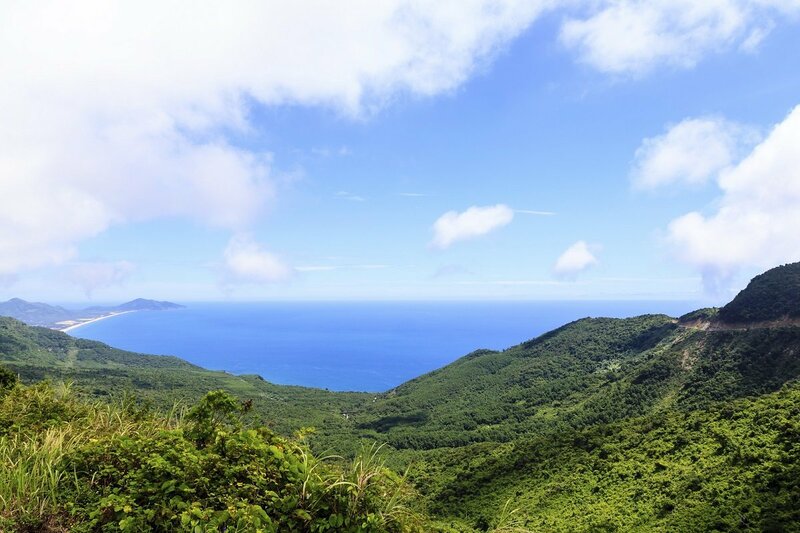 Of course, you could choose simply to relax and enjoy life and the view out over the islands and the floating fishing villages, treating yourself to an occasional swim in the turquoise sea. 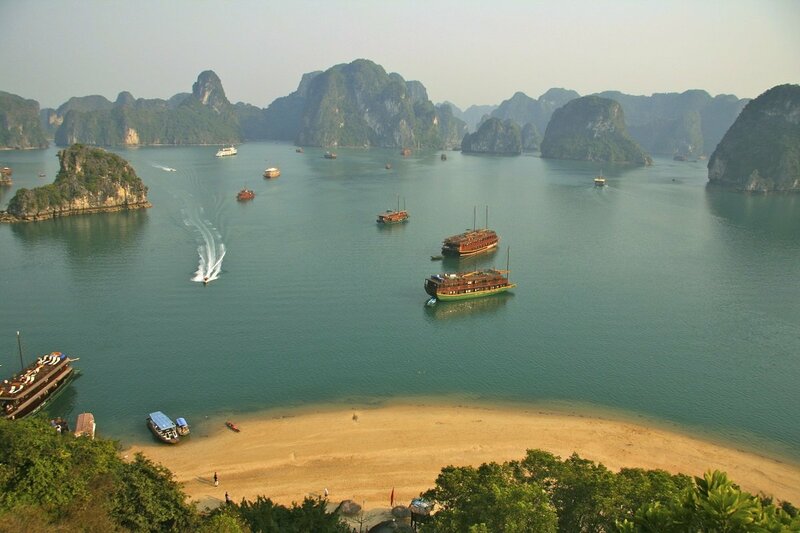 Start the day with a refreshing dip in the clear, warm waters of Ha Long Bay, or perhaps simply admire the sunrise from the magnificent sun deck – where you can also take part in morning exercises (usually Tai Chi). Breakfast is served while the boat starts to glide peacefully back towards the harbour. On the return trip, there will be time to visit a grotto to admire the impressive stalagmites and stalactites. 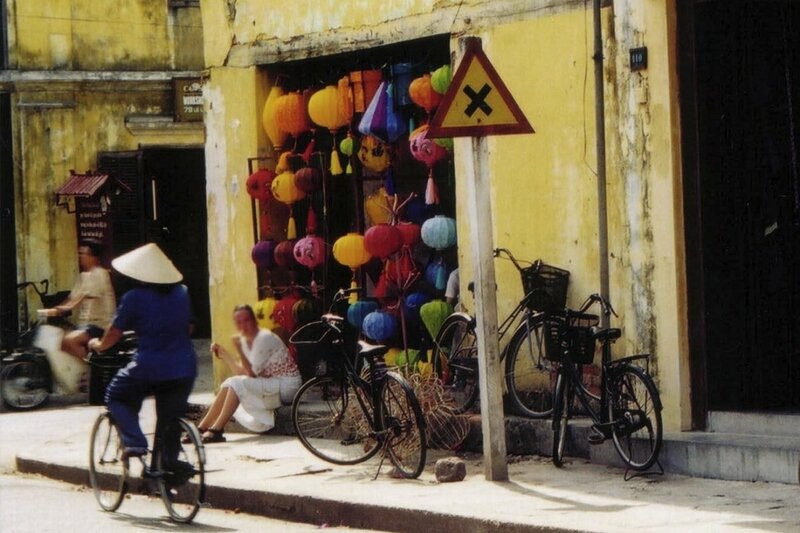 Once you return to dry land, it is time to head off to Hanoi by road. 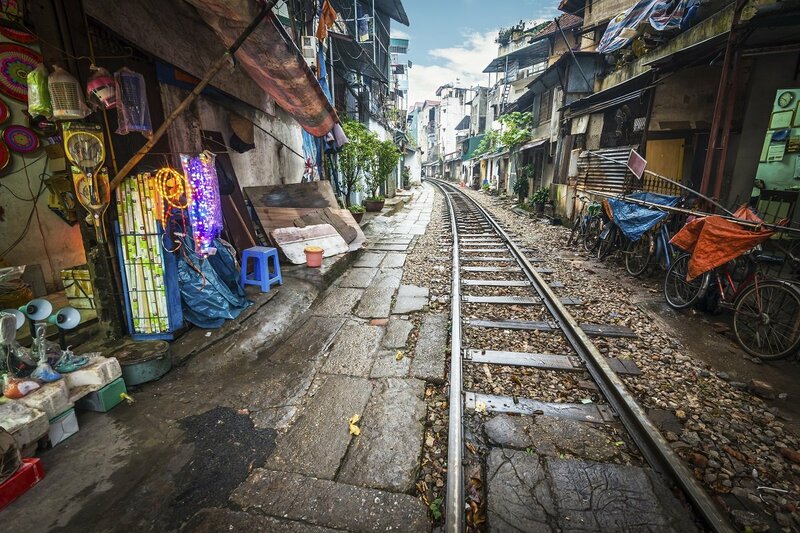 You will then have a few hours in the city to do with as you wish before your guide accompanies you to the station to catch your train to Danang. 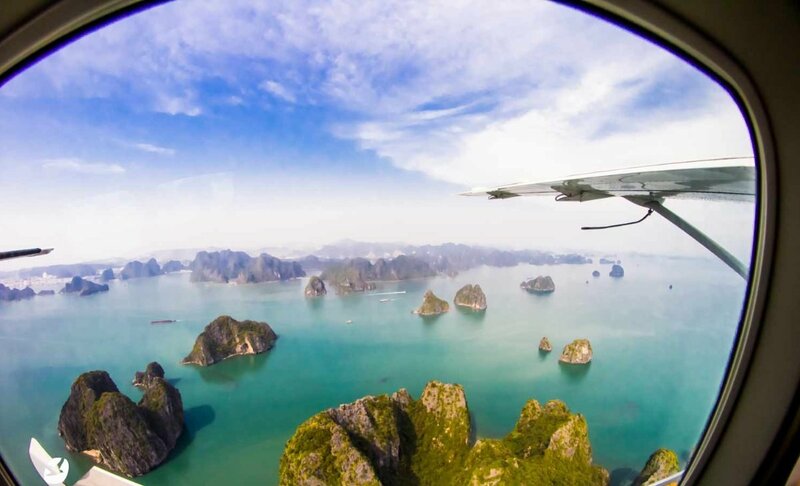 For a surcharge, you can fly from Hanoi to Danang instead of taking the night train. 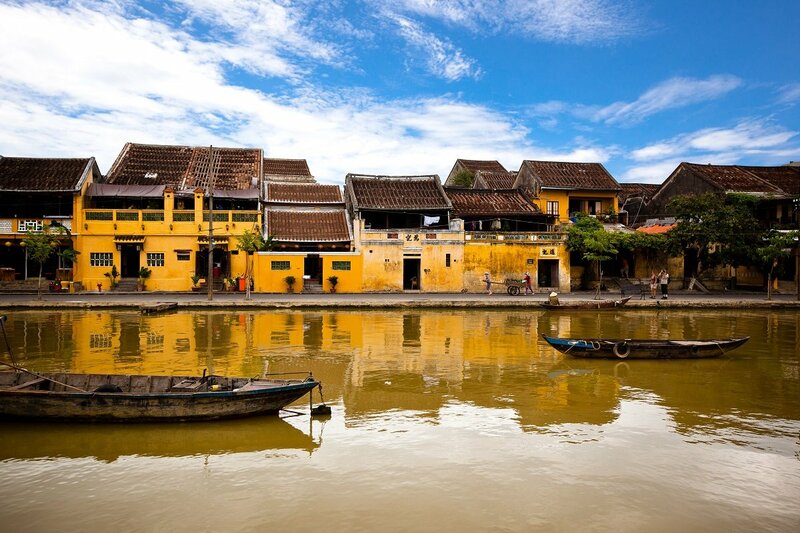 This option will include an extra night in Hoi An. These days are yours to do with as you wish. You can choose to spend them enjoying the beach and the water, or exploring the charming city and the old harbour area. 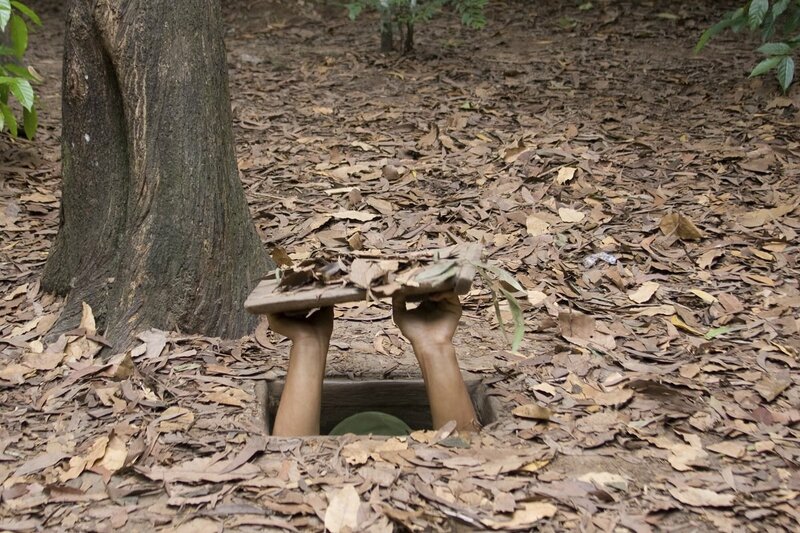 On the agenda for today: a half-day excursion to visit the Cu Chi Tunnels. 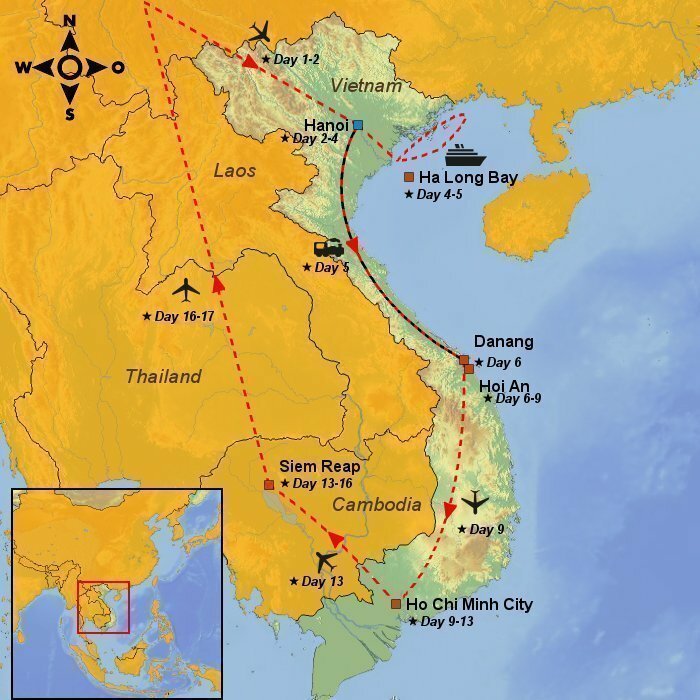 During the Vietnam War, the North Vietnamese troops – the Viet Cong – constructed a huge network of tunnels linking underground command centres, staging posts, schools and training facilities. The tunnels also served as hiding places for launching ‘pinprick’ attacks on the American forces. The entrances to the tunnel system are tiny, and the tunnels themselves were constructed for people small in stature. 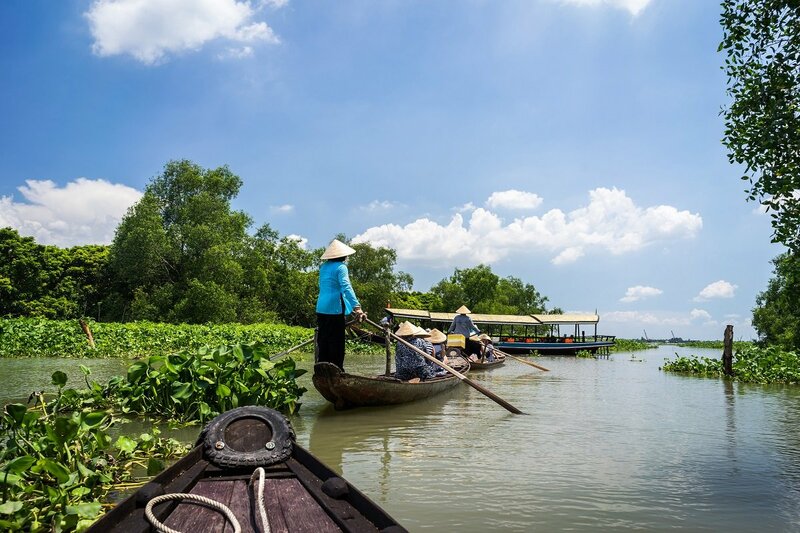 After lunch, the boat sails back to Cai Be, and you then return to Ho Chi Minh City. 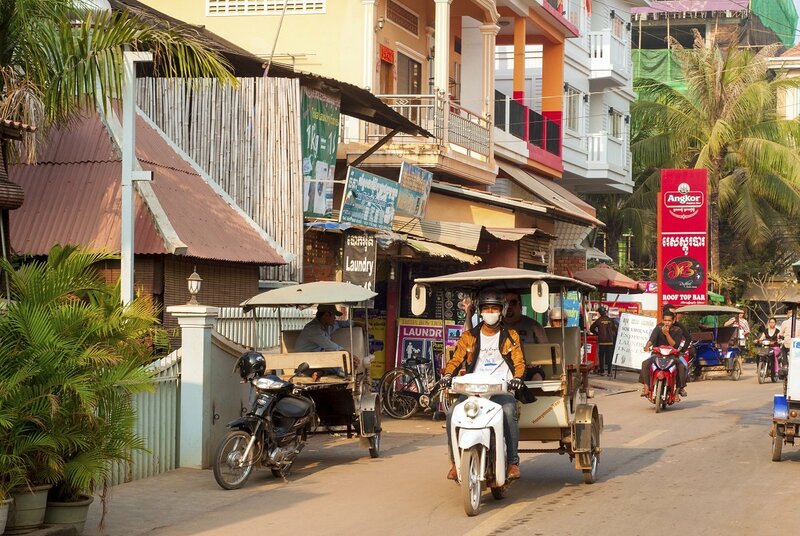 From Ho Chi Minh City, you fly to Siem Reap. On arrival, and after passing through customs and immigration, you will be met at the airport by your guide who will accompany you to the hotel and help you check in. Once you have checked in, it is time to head off to the Angkor Wat temple complex to visit some of the best-preserved temples at the site. To round off the day, you can enjoy the magnificent sunset over Angkor. The day starts at the southern gate to Angkor Thom, where you will have the opportunity to explore Bayon, one of the main buildings in the city ruins. Bayon comprises 54 towers decorated with more than 200 stylised smiling faces carved in stone. During the morning, you will also visit the royal enclosure, Phimeanakas, the Elephant Terrace, the Leper King Terrace and – of course –Ta Prohm Temple, which received global exposure in the film ‘Tomb Raider’. connecting flights along the way.